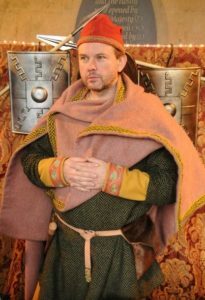 We base our learning sessions in the time of King Alfred the Great – the only monarch ever to have been awarded the title ‘The Great’ in the latter days of the 9th century. Sessions may involve more than one educator as per your requirements- so students benefit from a carousel of activities on a variety of topics- such as understanding The Migration Period of our history after the decline of the Roman empire, poetry & sagas, life in the burgh, medicine & surgery, differences between rich and poor, food, trade and warfare. We can also bring in a Viking for understanding the differences between the cultures at this time. Our Anglo-Saxon day includes a great selection of objects for study and handling, with Anglo Saxon names for all students, role-play & dressing up activities, military weapons, tactics and battles, have-a-go activities such as: making butter, striking a coin, grinding corn, fire-lighting with flint & steel, understanding food & diet, plus comparisons with our lifestyle today.